For some reason, Sasy Scarborough who has survived on 11 hours of sleep over the past three days while making sure that Hair Fair is as perfect as it can be, does not show the ill effects of lack of sleep. I have to confess that once again, Hair Fair is designed to make this massive event as enjoyable as possible. This is a directory of all locations of the Hair Fair 2015 Event. If you follow the path, you will visit every store on every sim…keep the stores to your left side, and keep walking. All items sold at Hair Fair 2015 donate a portion of their sales to Wigs for Kids. 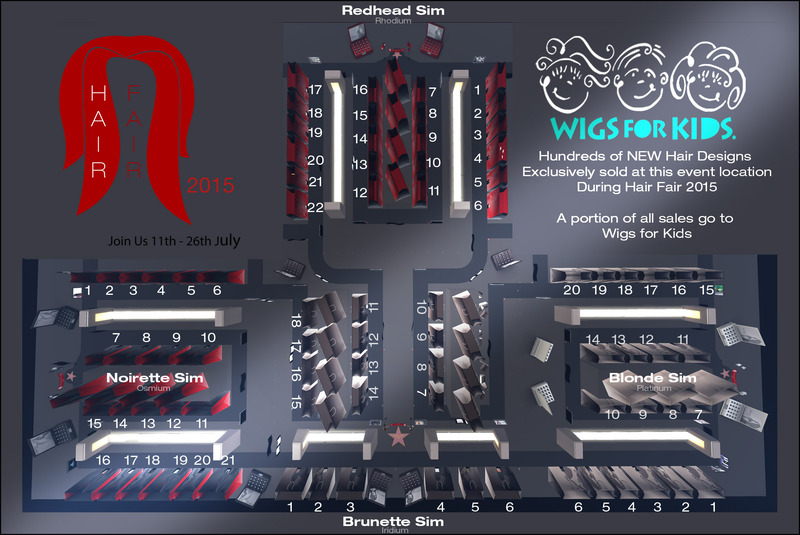 This entry was posted in Expos, Fairs and Fundraisers, iheartslFeed, It's Fashion, Second Life and tagged Hair Fair, Hair Fair 2015 on July 11, 2015 by Cajsa Lilliehook.